Although the topic has sparked an abundance of rhetoric from the lips of Potus, there’s been no mention of the cost to American households, to taxpayers at the federal and state levels, no hint of opportunity cost (the value of the best alternative forgone), nor of any economic benefits, but merely an odd discourse involving a man-made solution for regulating the Earth’s temperature, namely through taxing and regulating our largest source of electricity, coal fired power plants, out of existence. The unanswered questions surrounding Potus’ latest craze are as follows: How much is it going to cost? Who’s going to pay for it? And, how will it benefit America? I recently came across an interesting article on Climate Central entitled, “Replacing Coal With Clean Energy — Let Me Count the Ways” (July 2011). The author, Alyson Kenward, ponders where all the new “clean energy” will come from after Potus destroys the coal industry. She explains that coal and natural gas produce about 70 percent of our electricity, nuclear power around 20 percent, renewable sources like wind and hydro-power roughly 10 percent, and how this ratio would need to change. According to Potus, natural gas counts as clean energy, because even though it produces CO2, its emissions per kilowatt-hour (KWh) generated are only half as much as coal. Thus, if we were to leave all the current natural gas fired power plants in place, and not build any new ones, hitting the 80 percent target means that roughly 46% of the nation’s coal production would need to be replaced. As Ms. Kenward explained, and I concur, this won’t be a simple task, since coal alone currently provides 37% of America’s electricity. Ignoring the costs, Ms. Kenward came up with six ways the U.S. could achieve Potus’ objective. Counting the costs, I have slightly revised and modified Ms. Kenward’s analysis, while maintaining its integrity, focusing on just one of her six possible ways, which I will call Method Number 4. After weighing the costs and benefits, we will be able to decide for ourselves whether or not Potus’ idea is feasible. We could build 7,529 solar energy farms — but each one would have to be the size of Nevada’s Copper Mountain solar array. The U.S. produces just over 4 trillion KWh of electricity each year, of which coal is responsible for 1.5 trillion KWh, or 37%. In order to reduce the ratio of electricity produced from coal to 20% would require a substitute capable of generating roughly 689 billion KWh per year. Nevada’s Copper Mountain solar farm produces around 92 million KWh a year. So to reach Potus’ target would require building 7,529 similar solar farms over the next 22 years, or 342 per year. Permanent jobs created: 5. That’s not a typo. State incentives developer Sempra Generation received: $12 million. That’s not a typo, either. So not only will solar power cost more than three-times as much as coal to implement and produce, but when it’s all said and done our power bills will likely be more than 50% higher, as ratepayers’ pass their costs on to consumers. This fact alone should disqualify solar energy as a viable alternative for our electric power needs. The Nevada Economic Development Commission said the project cost $141 million. The federal government gave Sempra Generation about $42 million in tax credits, 30 percent of the price tag for Copper Mountain. When we include the $12 million in state incentives, mentioned above, we find that 38% of its total cost was provided by federal and state tax dollars. That’s all well and good, except for the fact that we would have to replicate the process 7,529 more times in order to reach Potus’ target. Using simple math puts the total cost of Potus’ grand scheme at around $1,061,527,823,294 ($141,000,000 times 7,529). That’s $1.1 trillion, with potentially $316 billion subsidized by the federal government, and $90 billion by state governments. Although over a 22-year period this only amounts to around $48 billion per year, with $14 billion subsidized by the federal government and another $4 billion by the states, we must next weigh the economic benefits? In the matter at hand, a politician defending costs, without considering benefits, is akin to the federal government regulating the level of mercury emissions in the atmosphere, while simultaneously forcing every household in America to install mercury laced light bulbs. Frankly, I would rather have mercury way up in the atmosphere, than in the light fixture next to my bed. In other words, if the costs outweigh the benefits, a project may ultimately do more harm than good. Construction of the Copper Mountain plant created 350 temporary jobs, which theoretically lasted about a year, although we don’t know how that was calculated. There could have been high turnover (i.e. 175 jobs filled by 350 persons). However, if 7,529 similar plants were to be built, in raw terms, it may result in the creation of as many as 2,635,150 temporary construction jobs, over a period of 22 years. Although that sounds great, it only amounts to 119,780 temporary jobs each year, or 9,981 jobs per month. The catch is that because these jobs are temporary in nature, lasting perhaps a year at most, theoretically the same crew would be moving around from job to job. The net result is that only a total of 119,780 jobs are created over the entire 22-year period. How’s that you say? Well, as next year’s 119,780 jobs are created, last year’s 119,780 jobs come to an end. So in terms of temporary construction jobs, at best only 119,780 are created through the year 2035, at which point they disappear entirely. Although one might presume any amount of jobs growth a positive, because the U.S. needs to create roughly 127,000 jobs each and every month, just to keep pace with population growth, in the near-term, going solar adds virtually nothing to our ailing economy. According to Speaker of the House John Boehner, the coal industry is responsible for 760,000 good paying permanent jobs. If that’s correct, then Potus’ goal of reducing the coal industry by 46% would result in a loss of perhaps 349,600 good paying permanent jobs, assuming the entire industry doesn’t collapse in the process. And remember, Copper Mountain created just 5 permanent jobs (that’s not a typo). So once Potus’ scheme is fully realized, after 22 years and $1.1 trillion are squandered, the U.S. will have created just 37,645 permanent jobs (5 * 7,529). In the long run, Potus will have replaced 349,600 (or more) permanent full-time jobs with just 37,645, for a net loss of 311,955 jobs, an 80% reduction. Brilliant! By the year 2035, assuming we haven’t plunged into the Dark Ages, we will have higher cost electricity, something we already had at a much lower cost, and the nation will have achieved a greater level of unemployment with evermore people dependent on government aid. Well, so much for the economic benefits of Method Number 4. But at least the planet will be healed, right? Construction of an additional 7,529 Copper Mountain sized solar power plants would involve converting some 2,860,855 acres of land into solar farms (380 * 7,529). That equals an area of 4,470 square miles. Although this may sound like a lot, according to the USDA Economic Research Service, the United States has a total land area of nearly 2.3 billion acres. In 2007, the major land uses were forestland at 671 million acres (30 percent); grassland pasture and range-land at 614 million (27 percent); cropland at 408 million (18 percent); special uses (primarily parks and wildlife areas) at 313 million acres (14 percent); miscellaneous uses (like tundra or swamps) at 197 million acres (9 percent); and urban land at 61 million acres (3 percent). Since the Mojave Desert, which spans parts of California, Nevada, Utah, and Arizona, comprises an area of 22,000 square miles, a sufficient amount of land is not a problem. The only issues are ironically environmental. With all the CO2 hysteria these days, we won’t likely know of the negative effects of pointing thousands of square miles of polycrystalline, monocrystalline and amorphous silicon panels directly at the sun until something bad happens. After all, we’re just finding out that wind turbines aren’t all they were cracked up to be: “Rare bird last seen in Britain 22 years ago reappears – only to be killed by wind turbine in front of a horrified crowd of birdwatchers.” Not that environmentalist’s care about the needless slaughter of wildlife. And, you may recall that it was only after implementing the corn, sugarcane and soybean ethanol fads that we discovered the concept of carbon debt – that large amounts of trapped carbon are released into the atmosphere when vegetation burns or decays as land is cleared, and that this up-front carbon debt could take centuries to break even with emissions gradually avoided by substituting bio-fuels in place of fossil fuels. Oops! What would happen if every other nation across the planet were also to implement Potus’ program, turning several hundred thousand square miles of the Earth’s surface into a gigantic silicon light reflector? Would the atmosphere fry? Would people go blind? Would an ice age ensue? Would the number of violent storms, tornadoes and hurricanes escalate? Would the Sun explode? Are unknown negative effects of solar panels already having an impact on Planet Earth, and we’re just unaware? Is global warming propaganda really just a self-fulfilling prophecy? Industrial-scale solar development is well underway in California, Nevada, Arizona, New Mexico, Colorado and Utah. The federal government has furnished more public property to this cause than it has for oil and gas exploration over the last decade — 21 million acres, more than the area of Los Angeles, Riverside and San Bernardino counties put together. And even if only a few of the proposed projects are built, thousands of square miles of wild land will be scraped clear, and several thousand miles of power transmission corridors will be created. But many of these power plants will fail, as new technologies render older models like Copper Mountain obsolete, and the desert will be scarred well beyond a human life span. In fact, according to scores of federal and state environmental reviews, no amount of mitigation will repair it. But isn’t solar power the most efficient use of Earth’s resources? Capacity factor is a general term for all power generating systems and refers to the difference between what a system can achieve at continuous 100% output (its power rating) versus what it actually achieves under normal (less than 100%) operating conditions. The capacity factor for solar panels varies between 15% and 40%. This means, if a solar panel has a capacity factor of 25% its average energy output will be 25% of what it was designed to achieve. For example, a 100 watt solar panel with a capacity factor of 25% has an average energy output of just 25 watts. Thus, if you need 100 watts of power, you’ll need to install four 100 watt solar panels. Well, so much for efficiency! The capacity factor of a power station is the ratio of average output power to peak power that the station could deliver. Due to fluctuations in the availability of the primary energy source and outages due to maintenance of the equipment, the capacity factor is never 100%. In fact, for renewable energy sources, it is mostly below 50%. The capacity factors of solar power plants are particularly low, mainly because the sun is only above the horizon half of the time. This matters, because electric power plants are more cost efficient when they can be run at high capacity, with less fluctuation. Photovoltaic solar in Massachusetts – 13% to 15% (b). 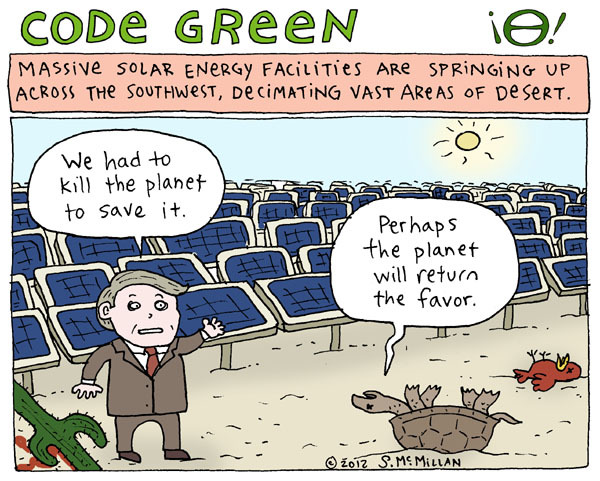 Photovoltaic solar in Arizona – 19% (b). 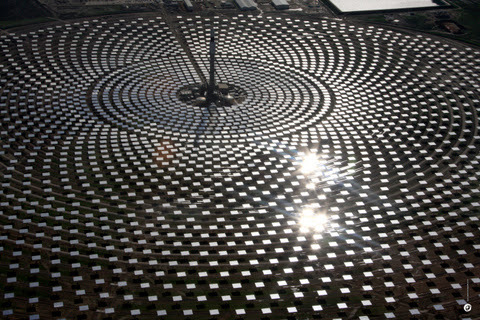 CSP solar in California – 33% (b). Wind farms – 20% to 40% (b). Natural Gas – 10% to 42% (a). 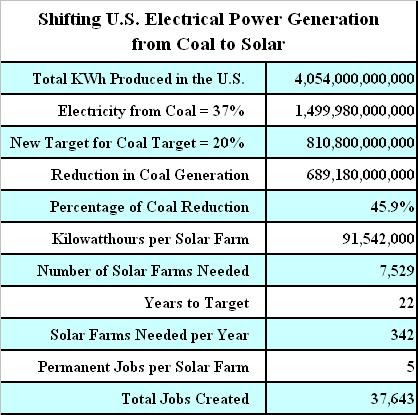 Since coal has a capacity factor of 63.8% versus solar energy’s 13% to 33%, when Potus speaks of replacing 46% of coal generated electrical plants with solar, what he really proffers is to replace our second most efficient source of electricity with the second worst. If efficiency were the goal, then it seems to me investing more towards nuclear power would be the best use of our resources. But what do I know? Nuclear power plants produce electricity 90.3% of the time, which trumps all other sources of electrical power. But sadly, per the table near the top, the U.S. only produces 19% of its electricity from nuclear, compared to 37% from coal, 30% from natural gas, 7% from hydro-power and just 0.11% from solar. What gives? Are we at war with efficiency too? Considering capacity factors, since there are 24 hours in a day, solar farms in the U.S. can at best deliver power for 8 hours out of 24 (33% of the time), and at worst for just 3 hours per day (13%). On the other hand, coal delivers power 15 continuous hours per day (63.8%), natural gas 7 hours a day (30%), and nuclear energy for 22 out of every 24 hours (90.3%). I don’t know about you, but I’ve grown accustomed to the convenience of electricity 24/7 (twenty four hours a day, seven days a week). Sorry, but going backwards isn’t a viable option. 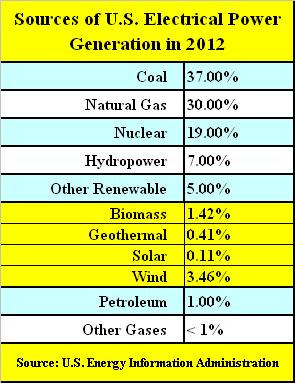 Today, 37% of our electricity comes from coal and just 0.11% from solar. Replacing 46% of coal fired power plants with solar, as Potus presupposes, would necessitate building approximately 7,529 Copper Mountain sized power plants at a cost of around $1.1 trillion, with potentially $316 billion subsidized by the federal government, and another $90 billion by the states. It would also require scraping and clearing 2,860,855 acres of land (4,470 square miles) for conversion to solar plants, and several thousand miles more for power transmission corridors to deliver the product to market, irreparably damaging to the planet. As far as benefits, on the one hand, we’ll have electricity, something we already had, so nothing is gained. On the other hand, since solar electricity costs three times as much to implement and produce as coal, unlucky consumers living in solar districts can expected to see at least a 50% hike in energy costs, and that’s on top of the additional taxes and fees all of us (including unborn generations) will be forced to pay in order to subsidize the scheme. 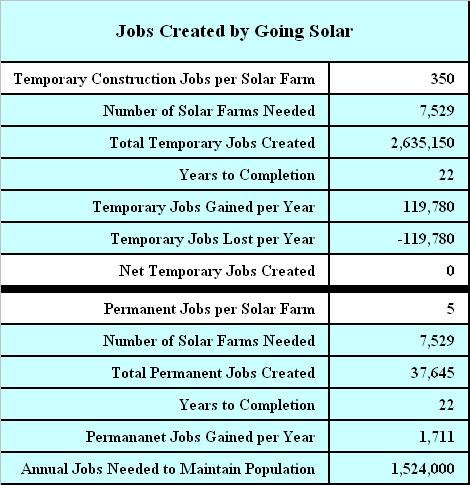 And although as many as 119,780 temporary solar construction jobs will be created and lost over the 22 year cycle, when it’s all said and done, only 37,645 permanent jobs will remain, while some 349,600 good paying coal industry jobs are destroyed. Finally, we will have reduced by 46% our second most efficient source of electricity, coal, which has a capacity factor of 63.8%, shifting reliance towards solar, which is at best only reliable 13% to 33% of the time. So the net economic benefits of going solar are less than zero (zilch minus). But at least the Earth’s temperature will theoretically drop by a fraction of a degree in a thousand years or so, unless it turns out that mankind really doesn’t control nature (i.e. 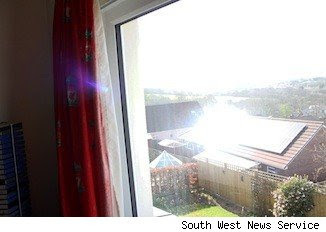 solar activity). For all we know the Earth’s temperature could vary wildly, between several degrees warmer or cooler, depending on the effects of converting thousands of square miles of the planet into a gigantic silicon light reflector. But then there’s this: If coal is so horrible, then why not just eliminate its use entirely? Well, one reason might be that we need a reliable source of electricity in order to make the more than 5.8 billion solar panels required to pull off Potus’ scheme (775,000 times 7,529). And if the goal really is the elimination of coal as a natural resource, then just take my figures above, multiply them by 2.18, and you’ll have a good approximation of the costs and benefits. 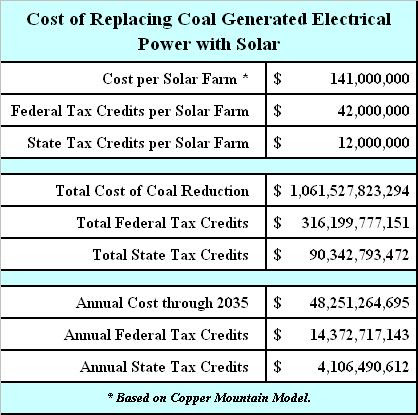 What you will discover is that in order to eliminate coal entirely, we would need to build approximately 16,386 solar farms, covering an area of more than 9,729 square miles, at a cost of more than $2.3 trillion. Anyone have an extra $2.3 trillion lying around? Just like all other brilliant recommendations emanating from the mouths of crony politicians, solar energy turns out to be the most expensive, the least economically beneficial and the least efficient means to an end. An end which in their minds is just another way to game the system and cash in on the ignorance of the masses. Fortunately, just as the corn ethanol boondoggle of the last decade has now faded, this solar power fad too shall pass. If our goal is a return to the inefficiencies of the 19th Century, then perhaps we should follow the dictates of Potus, but if we are really serious about cleaning up the environment and producing reliable, efficient and abundant electrical power, it seems to me we should be moving towards Thorium (nuclear energy without the waste). Energy from Thorium – Nuclear Energy without the waste! The Gemasolar Thermosolar Plant in Spain has battery storage (Size = 480 acres, Cost = $260 million), but then again the unemployment rate in Spain is 26.8%, if that means anything. Every time someone comes up with the next generation of solar panels, the billions of dollars already wasted is rendered obsolete. If any solar farms are profitable, it's only because the government mandates power companies to buy their energy at inflated prices. If not for the government's manipulation and price-fixing, power companies would choose the least expensive, most efficient means. The planet faces a crisis of survival, Why would we foolishly continue to help those industries who continue to cause damage to our planet and environment? In terms of the social costs, the current approach to energy––tapping fossil fuels––is never acknowledged, which, if those cost were acknowledged, would then bring us to the realization that long-term sustainable, renewable energy alternatives are the ONLY solution. We must transform our energy system and move away from fossil fuel-based energy to sustainable, renewable clean energy. See “Achieving The Green Economy” at http://www.nationofchange.org/achieving-green-economy-1373980790. Also see it complete with the footnotes at http://foreconomicjustice.org/?p=9082. Nuclear power plants produce electricity 90.3% of the time, which trumps all other sources of electrical power. But sadly, per the table near the top, the U.S. only produces 19% of its electricity from nuclear, compared to 37% from coal, 30% from natural gas, 7% from hydro-power and just 0.11% from solar. What gives? Are at war with efficiency too? the nuclear thing? that favors china and russia since the US has one of the largest reserves of materials. so its BAD for Canada, and Australia and the US from having nuclear..
did you really think that melamine was in toys and lead by accident?